How to Buy Saucepans Right for You and Your Hob! Here’s where you’ll discover how to how to buy saucepans right for you and your cooking hob. Do you just want cheap saucepans? You know, ones with loose handles and blistering non-stick? 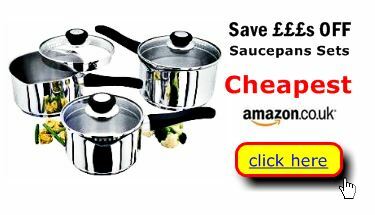 Or would you prefer the best saucepans at the cheapest prices in Britain? It’s really simple. In each table below find your hob type and check which saucepans sets are compatible. Next choose your construction material. Aluminium & Anodised (hardened) Aluminium are lighter in weight and offer consistent heating across the base of the pan and its sides. Stainless steel is obviously more durable but heavier. From our user research we’ve identified 5 saucepan sets that offer great value for money, deliver consistent cooking results and provide great user satisfaction (even at pot washing!). The overall best buy is the Judge Vista set at around £50. If you want to roll the boat out the Le Creuset stainless steel is highly rated by users. It’s reassuringly robust but doesn’t weigh a ton like Le Creuset cast iron products. * Overall Users’ satisfaction Rating. How all users rated their experience of their saucepans after 6 weeks use. The best value saucepan sets really can be had for less than £70. As you can see this price point takes in all three of the user nominated “best buys”. See how all these cookware sets have user satisfaction ratings in excess of 9/10. That’s because they deliver on value, ease of use and durability. In cooking terms that means they are easy to use, with minimal spillage, easy to clean up and will look good for years to come. These saucepan sets sell for £100 or more. All of them have riveted handles (the sort that don’t come loose after a couple of years) and stay cool handles and saucepan lids. As you would expect from quality cookware they are reassuringly robust without requiring both hands to lift. There are loads of saucepan sets on the UK market, so choosing the right one for your needs can be confusing. After extensive research among 1600 consumers we’ve located the top 10 saucepan sets in the UK. These are the cookware users recommend (after at least six weeks of daily use). We’ve put these cooking pots and pans into a handy comparison table so you can review saucepans sets at a glance. The best buys compare saucepans table lets you see what owners think and enables you to review saucepans like for like. And that’s not all. We help you choose using the practical advice of the owners of these cookware sets. At Best Buys for saucepans reviews we get owners and users to tell us what they think of their purchase in a structured, easy to compare manner. They’ve told us what matters to them as they daily prepare their family’s food. The things that matter in cooking are simple things like riveted, secure handles; robust, see-through glass lids; stay cool lid knobs and easy draining pots. Plus, of course, you want to buy saucepans set that delivers consistent cooking on your hob – whatever the fuel. And an easy clean up after cooking. At Best buys compared we deliver a daily, UK-wide price research service. Consider any of the saucepans on display here. They are the undisputed top 10 in Britain – as nominated by users. On our price research pages we display the top 3 cheapest prices. That means you – wise shopper – can nab the best deal without the slog of tramping through malls or enduring wind-swept retail parks. So, if you are after the best saucepans at the cheapest price you’ve come to the right place. Top 10 Saucepans UK | Which saucepans are best?